Fried chicken is a comfort food staple, especially in the South. When it's properly prepared, the outside is crispy and golden, and the inside is moist and juicy. Occasionally, the golden appearance can be marred by trickles of blood or other red juices from inside the meat. This can be addressed before cooking the chicken. With chickens, as with humans, oxygen is distributed through their cells by hemoglobin in the blood and myoglobin in the muscle tissues. These substances contain iron, which gives them their characteristic reddish hue. You'll see dark red blood oozing from the ends of the leg bones and sometimes from the femoral artery in the thigh. Paler myoglobin starts red and becomes clear as the chicken cooks. With very young fryers, the meat along the leg bones often can look red and bloody, even when it's fully cooked, because the bones allow red pigment from the marrow into the meat. One way to minimize the appearance of blood or myoglobin in your cooked chicken is to soak it before cooking. Trim your pieces of chicken, removing pockets of excess fat and skin if any are present. Place the chicken in a large glass or stainless steel bowl and cover it with ice water. Soak the chicken for 30 minutes, then drain it thoroughly and pat it dry with paper towels. Much of the blood and myoglobin will soak away in the cold water. The effect of pre-soaking is magnified if you add salt to the water, turning it into a brine. This is the process used to "kosher" chicken by removing the blood from the bird through osmosis. Savvy cooks take advantage of this by adding herbs and spices to the brine, knowing the salt will carry them into the meat. The net effect is a moister, tastier piece of chicken with much less blood. 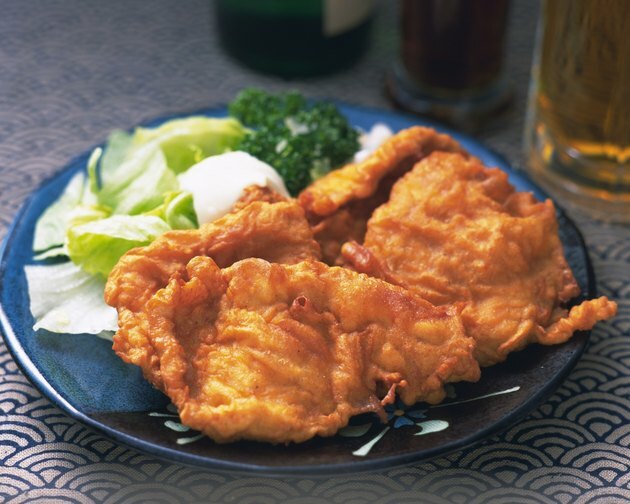 Like simple soaking, brining reduces the likelihood of the chicken bleeding when it's fried. Cooking causes physical changes in the chicken. As the proteins in the muscle tissue and bone marrow are heated, they begin to contract and become firm. When they contract, the cells are unable to immobilize as much liquid within their walls. This means that blood and myoglobin are forced out. Some cooks par-cook their chicken by simmering it in water or broth before frying. That expels much of the blood and myoglobin from the meat, leaving less to discolor the chicken when it's fried. If I Pump & Blood Gets in the Bottle Is It Still OK to Give the Baby?